Manual transmission, front wheel size 17”, rear wheel size 14”, air cooled 125cc 4-stroke single cylinder engine, kick start, seat height of 32.28”, and front and rear hydraulic disk brakes. 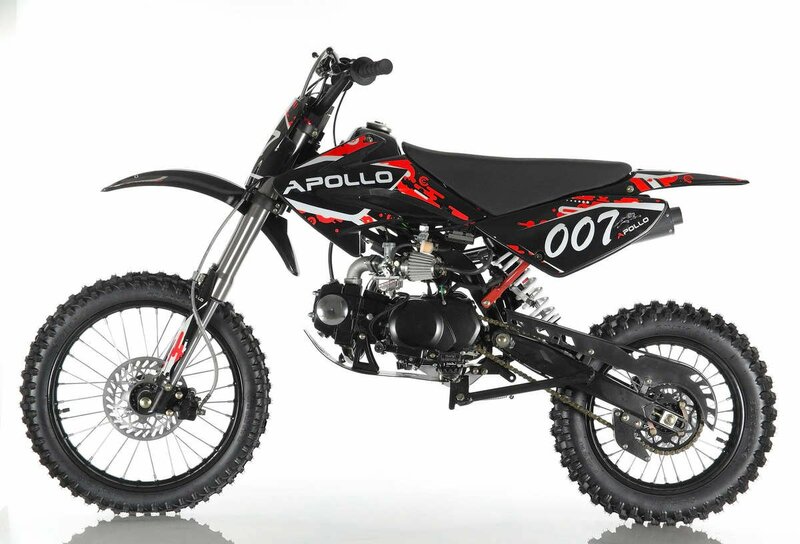 The Apollo 125cc DB-007 Dirt Bike contains a 4-stroke, single cylinder engine with a top speed of around 45 MPH. It is available in either red, blue, green or yellow colors. It features a manual transmission with both front and rear hydraulic disc brakes, a twin spare heavy duty steel frame, and non-adjustable 29.9” front and 12.5” rear suspension. Although similar to its little brother the Apollo DB-34 110cc in many specs, the Apollo DB-007 offers a larger 125cc engine, which means a substantial acceleration upgrade, and the fully manual clutch offers a greater degree of control over its little brother, which is semi-auto. If you already own the DB-34, and are looking for a bike with similar features and ride feel, but with an upgraded engine, or looking for manual clutch control, this is the bike you want. 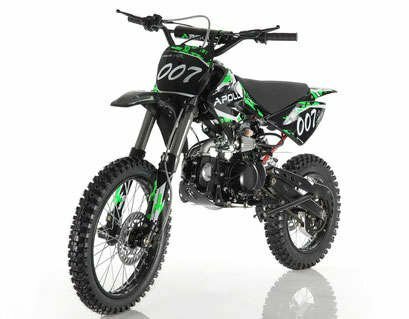 It is a little on the smaller side, as far as dirt bikes go, but the smaller size allows for a pretty high top speed for this engine class, and some really zippy acceleration. If you’re looking for that extra oomph from a 125cc bike, in terms of both top speed and acceleration, this is the bike you want. A really sturdy steel frame and both front and rear brakes ensure excellent safety features, and the Apollo DB-34 can confidently handle pretty much anything you throw at it, as long as the smaller frame size isn’t a deterrent.